The 2011 ford flex electric vehicle qualifies for a federal tax credit of up to $7,500, effectively reducing the net base price. The 2011 Flex is Ford's answer to rivals such as the GMC Acadia and Honda Pilot. Designed to carry seven passengers, yet achieve the same kind of fuel economy as a mid-size sedan, the Flex is part of a growing trend away from V8-powered leviathans and toward more space efficient vehicles, particularly when towing is not a high priority. If all you need is room for the family, a minivan or mid-size SUV could certainly do the trick, but neither have the cutting-edge cool the square-as-a-shoebox Flex seems to ooze. You might even have to wrestle your teenagers for driving privileges – and why not? With room for lots of their friends, an optional built-in refrigerator and the technology-friendly SYNC audio system, the Flex can easily transform itself from family transport to Friday-night cruiser with just a turn of the ignition. If you've outgrown the need for your minivan, or you're just getting to the point where you think you might need one, the 2011 Ford Flex offers much of the same versatility in a package you'll be proud to show off to friends and co-workers. If you need a vehicle that can tow more than 4,500 pounds, the Ford Flex takes a back seat to its larger, V8-powered siblings, the Explorer and Expedition. Functionally, the Flex's third-row seat is not as roomy or easy to access as that of the Chevrolet Traverse. For 2011, a new Titanium trim on the Ford Flex joins the SE, SEL and Limited. The Titanium is easily identified by its blacked out tail lamps, black chrome grille, black roof, black mirror caps, unique interior and 20-inch painted luster nickel wheels. Other 2011 Edge improvements include the addition of HD radio to the optional navigation package, and an available power folding third-row seat with reversible tailgate feature that allows the seat to face outward from the rear hatch. The Flex's ability to maneuver through tight turns is matched only by its well-mannered ride and hushed interior. Despite its boxy SUV appearance, the Flex is surprisingly nimble, providing quick turn-in response with little sway or body roll. At highway speeds, the Flex slices through the air impervious to the commotion its boxy shape should be causing. A generous helping of laminated glass keeps wind and road noise at bay, and the superb front seats never left us feeling fatigued or unsupported. Running the Flex through a few simulated emergency maneuvers proved Ford's AdvanceTrac stability and traction control system more than capable of keeping the Flex under control, and although we were not able to test it, the optional all-wheel drive is sure to add peace of mind when encountering slippery road conditions. The ideal option for long trips with the kids, the Ford Flex's rear-console refrigerator can hold up to seven 12-ounce cans. And, with a low of 23-degrees Fahrenheit, it can double as a mini ice cream cart. One of the best audio options in the industry, Ford's SYNC communications system features a voice-activated command center that can access music from an attached MP3 player, pick up and place calls from a Bluetooth-enabled cell phone and even speak incoming text messages. The interior is where the 2011 Ford Flex really shines over the competition. From its innovative features, including an available center-console refrigerator and massive four-panel Vista skylight, to the high-quality look and feel of its interior parts, the Flex excites the senses. Ford's extensive use of interior lighting adds a rich ambience at night and is complemented by such lavish details as the diamond sew pattern on the Limited trim's leather seats. Accommodations for front and second-row passengers are quite generous, but the third-row seat is short on legroom and the second and third-row seatbacks are a bit low, requiring taller passengers to fully extend the head restraints. Available power-adjustable pedals help any size driver feel comfortable behind the wheel. And, when not carrying human cargo, the Flex's front-passenger, second and third-row seats can be folded flat to create a massive level load floor. The Flex's modern exterior strikes a chord with so many people because it seems both familiar and new at the same time. The parallel groves running down its sides are a variation on the old wood-paneled wagons of the 60s and 70s, a design element that works in conjunction with the aluminum-plated rear hatch and optional contrasting roof paint. You can see subtle hints of Scion xB and MINI Cooper in the Flex's reflection, yet its boxy, upright sides and bold front end are pure Ford. The large wheels and low ground clearance may not be well-suited for off-road adventures, but they combine to give the Flex a very agreeable driving experience – and a just plain cool look. The Flex comes in four trim levels: SE, SEL, Titanium and Limited. Standard equipment includes Ford's keypad keyless entry, a six-way power driver's seat, tilt/telescopic steering wheel, Reverse Sensing System, fog lamps, Easy Fuel capless fuel system, front and rear air conditioning, an MP3-compatible CD player and a leather-wrapped steering wheel with controls for cruise control and audio. Moving up to the top-of-the-line Limited and Titanium trims brings heated front seats, a 10-way power driver's seat with memory, Sony Premium audio with Ford SYNC communications system, voice-activated navigation, leather interior, a power rear liftgate, power folding third-row seat, dual-zone automatic climate control and 19-inch polished aluminum wheels (20-inch on the Titanium trim). Standard safety equipment on all models includes three-row side-curtain airbags and AdvanceTrac electronic stability and traction control with Roll Stability Control. Options for the Ford Flex vary by trim and include a 355-horsepower EcoBoost V6 (SEL and Limited), rear backup camera, power rear liftgate, heated second-row seats with power Autofold mode, second-row captain's-chair seating with rear-console refrigerator, four-panel Vista roof, all-wheel drive, a contrasting painted top, remote start, a rear-seat DVD entertainment system and Park Assist active parallel parking aid. Ford currently offers two powertrain options for the Flex. The standard engine on all trims is a 3.5-liter V6 engine with variable valve timing attached to a six-speed automatic transmission. The smooth and efficient V6 generates a respectable 262 horsepower and 248 pound-feet of torque – not the best in class but certainly far from being tagged as anemic. Fuel economy, on the other hand, is near the top of its class, with an estimated 17 miles per gallon city and 24 highway. All-wheel-drive models earn slightly lower estimates. Optional on SEL, Titanium and Limited trims is the EcoBoost V6, which mates the 3.5-liter engine with gasoline direct injection and twin turbochargers to produce an impressive 355 horsepower. Ford claims the EcoBoost engine delivers V8-like performance with V6-like fuel economy, though at 16/21 mpg, the claim seems like a bit of a stretch. Flex's equipped with EcoBoost also feature all-wheel drive as standard equipment. 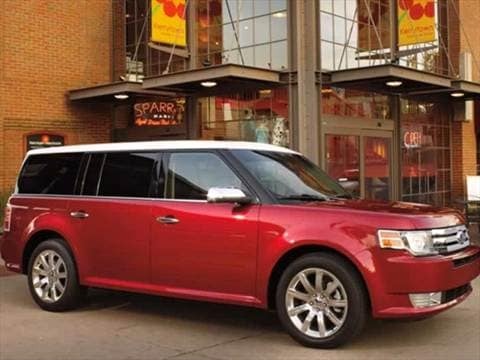 The 2011 front-wheel-drive Ford Flex SE has a Manufacturer's Suggested Retail Price (MSRP) starting around $30,000, while the SEL starts closer to $32,500 and the all-wheel-drive version is past the $34,000 mark; a fully-loaded Limited or Titanium trim with the EcoBoost V6 tops out just over $50,000. The Flex's pricing is in line with competitors such as the Chevrolet Traverse and Honda Pilot, but slightly higher than a comparably-equipped Hyundai Veracruz. To make your best deal, be sure to check the Fair Purchase Price, which shows the typical Flex transaction prices being paid in your area. As for resale value, Kelley Blue Book expects the Flex to hold a good portion of its original purchase price, surpassing the Hyundai Veracruz, on par with the Chevrolet Traverse, but falling slightly behind the Honda Pilot. Not a bit of trouble with this vehicle.